“When parents and teachers bring The Elf on the Shelf into homes and classrooms, are they preparing a generation of children to accept, not question, increasingly intrusive (albeit whimsically packaged) modes of surveillance?” ask Laura Elizabeth Pinto and Selena Nemorin in an essay for the Canadian Center for Policy Alternatives this December. [I]n other games, the child role-plays a character, or the child imagines herself within a play-world of the game, but the role play does not enter the child’s real world as part of the game. As well, in most games, the time of play is delineated (while the game goes on), and the play to which the rules apply typically does not overlap with the child’s real world. The gaze of the elf on the child’s real world (as opposed to play world) resonates with the purpose of the panopticon, based on Jeremy Bentham’s 18th century design for a model prison (a central tower in a circular structure, surrounded by cells). 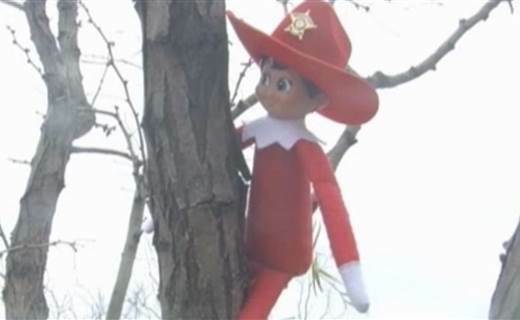 Anthony L. Fisher writing at Reason connects the point Pinto and Nemorin are making about the Elf of the Shelf—the “creepy side-eyed gnome [who] has spied and informed on millions of kids to an unaccountable power broker at the North Pole—to the “Stasi-meets-stalker lyrics” of Santa Claus Is Coming to Town. It is the sort of thing that makes people roll their eyes at libertarians. But consider my own experience. “Mom, why does Santa Claus think it’s bad when kids cry?” my daughter asked a couple of weeks ago. Not my proudest moment as a parent, I confess. We were in the car, the roads were slick, and I was distracted. I was fixated on my “Santa Dilemma.” I have truthfully answered every hard question my kid has asked: how babies are made; why her parents do not live together; about religion and death. The last one was the hardest. But I have told vast lies about Santa, manufactured complex, extensive secondary lies in support of the claim that such a being exists. Now she is old enough to recognize that Santa’s existence is inconsistent with everything else she knows of the world; to analyze the available “evidence” for Santa, for flying reindeer, elves, a village located at the North Pole, and for Mrs. Claus. If she asked me flat out, I would confess everything. But all she does is probe around the edges, and I cannot bring myself to utter the words. The gnawing guilt over whether I am making the right choice between destroying the magic or allowing the magnitude of betrayal to grow with each passing year got in the way of my hearing the question behind the question. Why does Santa Claus think it’s bad to cry? Two days later, I got it. My daughter’s voice was tremulous and thick with emotion. We were in the car again, on the same slick roads. But all at once, it hit me. When she cries, it is usually over something real, something that merits tears. Someone stopped being her friend at school. Or she misses someone in her family. Why indeed would Santa think that’s “bad?” Who is Santa to decide? This is not a concept I have taught her. We have no “naughty and nice” lists. Our Elf gets played with like a doll. He never spies or tattles. Yet somehow my daughter has picked up on the concept. Under normal circumstances, children’s behaviour (i.e., what is “naughty” and what is “nice”) is situated in social contexts and mediated by human beings (peers, parents, and teachers) where the child conceptualizes actions and emotions in relation to other people and how they feel. Through play, children become aware about others’ perspectives: in other words, they cultivate understandings about social relationships. The Elf on the Shelf essentially teaches the child to accept an external form of non-familial surveillance in the home when the elf becomes the source of power and judgment, based on a set of rules attributable to Santa Claus. … Broadly speaking, The Elf on the Shelf serves functions that are aligned to the official functions of the panopticon. In doing so, it contributes to the shaping of children as governable subjects. Before a certain age, children’s behavior is either genetic or it is learned from their environment. Manipulating them with an omniscient, omnipotent “daddy” overseer—a god-power with a jolly laugh and a bag full of rewards for conformance—is just passing the buck. I prefer to let my daughter learn right and wrong by interacting with real people, not under threats from imaginary spies. I prefer to let her enjoy the magic of the season.